Researchers from the UCL Centre for Longitudinal Studies analysed data on more than 6,000 children born in the UK at the turn of the century, who are being followed by the Millennium Cohort Study. The researchers examined reports of children’s mental health at ages 3, 5, 7, 11 and 14, including emotional problems, such as feelings of low mood and anxiety, and behavioural problems, such as acting out and disobedience. They compared information on children who experienced a family split with those who didn’t. A fifth of children in the study saw their parents separate between the ages of 3 and 14. Children whose parents broke up in late childhood and early adolescence, between the ages of 7 and 14 had, on average, a 16 per cent increase in emotional problems and an 8 per cent rise in conduct issues in the short-term. Children whose parents separated earlier, between ages 3 and 7, were no more likely to experience mental health problems either in the short-term or later on, by age 14, than those living with both parents. Among older children, increased emotional problems were apparent for both boys and girls, but heightened behavioural issues were observed in boys only. The researchers also found that after a family break-up, children from more privileged backgrounds were just as likely to have mental health problems as their less advantaged peers. 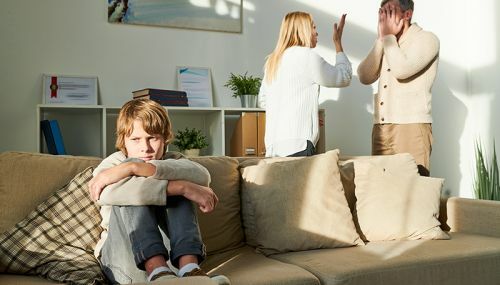 The research is thought to be the first in the UK to investigate the links between the timing of family break-ups and children’s mental health. It also comes much closer than previous studies to unpicking the role of parents’ separation from the wide range of other factors that can increase children’s emotional and behavioural problems. Using sophisticated statistical methods, the researchers were able to account not only for characteristics like family social background, and the children’s and mothers’ mental health prior to a split, but also experiences that are difficult to assess, such as the level of conflict in the home. The researchers investigated the impact of the break-up on the mothers’ mental health and financial resources. Across the UK, women accounted for 90 per cent of lone parents, and most children in the study lived with their mums after a split. Mothers reported, on average, more mental health problems than those still with their partners if they separated when their children were older. However, mothers who split from partners when their children were younger didn’t tend to report such increases in mental health problems, and indeed some beneficial effects on their mental health were observed later on, by the time their children had reached early adolescence. With the loss of an earner from the family, separation tended to have a negative financial impact on the household income of a lone parent at any time during their children’s upbringing. However, the loss of income was largest if they separated from partners when their children were in late childhood and early adolescence. This larger drop could be because parents tend to earn more by this stage of their lives, reflecting increased work experience. The researchers examined whether family break-ups during early and mid-childhood, between ages 3 and 7, increased the mental health problems of children at ages 5 and 7, and later, at ages 11 and 14. They then investigated whether family splits during late childhood and early adolescence, between the ages of 7 and 14 increased children’s mental health issues, in the short-term, at ages 11 and 14. The social background of children was measured by mother’s level of education. Children with mothers who were educated to at least A level had similar levels of emotional and conduct problems after their parents’ separation as those whose mothers were less educated.